Sometimes reputations have a tendency of preceding people. This seems to be the case of William Castle, director of horror films. In this day and age, Castle is primarily remembered for his copious use of gimmicks and show business ploys that drew audiences in with promises of visceral shocks the likes of which no other filmmaker could create. Electric buzzers, death certificate guarantees, and other schlocky devices filled the premieres of Castle’s movies, the macabre curiosity of the viewers drawing them into William’s theater of horrors. What too many people seem to forget is that Castle was actually a talented and effective director, capable of crafting a solid thriller despite seeming to be a simple Hollywood businessman by all appearances. 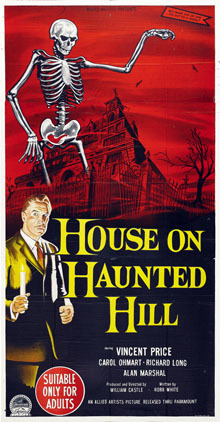 House on Haunted Hill is one of his great achievements and stands as a testament to the fact that Castle stood on par with his peers in the field of fear-making and creep-inducing goodness. The film opens to ghostly screams and wails, the disembodied head of Watson Prichard (Elisha Cook Jr.) informing us on the past of the House on Haunted Hill. Seven people have been murdered in its halls, including his brother, and their spirits now roam around in limbo. But that hasn’t stopped eccentric millionaire Frederick Loren (Vincent Price) from hosting a curious party at the house after renting it from Prichard. Loren’s tastes lean toward the bizarre and he promises a monetary prize of $10,000 to whosoever can last an entire evening within the bloodied domain of the house. The party guests are delivered in a line of hearses. 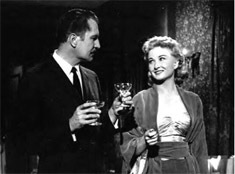 Aboard them are Lance Schroeder (Richard Long), a brave test pilot; Ruth Bridgers (Julie Mitchum), a columnist who is writing on ghosts and the paranormal; Watson Prichard, desperate to lay his own personal demons to rest as well as the ones in the house; Dr. David Trent (Alan Marshal), a psychiatrist studying the effects of hysteria on the human mind; and Nora Manning (Carolyn Craig), a pretty young woman under Loren’s employ. They all have their own reasons for coming to the house, greed for the cash prize being Loren’s prediction. As the group wanders through the art deco home, the steel front door slams behind them and a giant chandelier nearly crashes on top of Nora, Loren silently watching the scene from the stairwell. 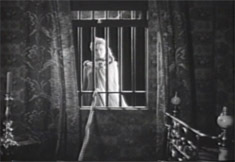 He tells his wife Annabelle (Carol Omhart) of the guests’ arrival but she is less than thrilled with her husband’s theatrics. The marital tension soon makes itself apparent; Frederick’s determination to prove Annabelle’s betrayal of their marriage boils under his grim jokes of her attempts to poison him for his money. Loren greets the party members in the parlor to explain the rules of the evening’s contest. He tells them that the caretakers will lock everyone in the house at midnight and not return until morning. Anyone who forfeits from the endurance test will instantly lose the money. But there’s more to worry about, according to Prichard. He claims that there are seven ghosts that plague the house… one for each of them. A tour of the house only brings horrible omens with it. The ever-present bloodstain of a murdered girl leaks through the ceiling and marks Ruth as a victim of the spirits’ wrath. An acid vat is revealed in the cellar, one that was used by the winemaker who built it when he tossed the body of his wife into its burning depths. Lance and Nora hang around in the basement to discuss the contest and money. When Lance heads into one of the underground closet spaces, the door closes behind him and Nora is terrified as the candles go out and a frightening, white-haired figure is spotted drifting through the shadows. Taking the group back into the cellar, Nora finds that Lance has mysteriously been hit over the head by an unseen attacker. After seeing that the gruesome elderly people she had encountered are the servants, Nora demands to leave the home at once. Too bad for her, the caretakers have already left without so much as a “goodbye” and have locked the house tight. In order to protect themselves from any danger, Loren passes out seven handguns that he has kept in little novelty coffins. This way if anybody is tempted to enhance their chances at winning the game, everyone will have a means to defend themselves. When Nora attempts to show everyone the gory find in her room, she is shocked to see the head has now disappeared. Her sanity is thusly questioned by all involved. 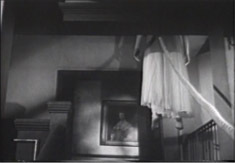 Finding the prop head in Nora’s closet, Lance confronts the drunk Prichard who can only stammer that the girl has been “taken.” Just then a scream rips through the house and Lance hurries in time to find the robed body of a woman hanging from a noose at the top of the stairs. With Trent’s help, they place the cadaver on a bed and Lance is surprised to see that it is Annabelle, not Nora. Loren’s reaction to his wife’s suicide is only a simple, unmoving realization. When Lance finds Nora, she hysterically says that Loren was trying to strangle her and left when he thought he had been successful. Smelling something rotten brewing in the mix, Lance locks Nora away in his bedroom while he holds a meeting with the rest of the party members. With everyone suspicious of the other, they all resolve to stay in their rooms with guns at the ready. Only the guilty party will make themselves known by leaving their rooms. While a storm begins to rage outside, Lance is determined to prove Loren killed his wife and heads out into the hallway. Finding another passageway, he once again becomes confined in its depths, leaving Nora to fend for herself. She is just about paralyzed with fear as the figure of Annabelle hovers outside her window, the noose around her throat coiling around Nora’s legs before it and the specter disappear into the darkness again. Nora runs into the corridor but finds escaping the horror isn’t so easy as she comes face to face with Annabelle’s hanging body on the staircase and hears the ghastly plunks of the dusty organ playing itself in the parlor. What no one suspects is that Annabelle is alive and well, discussing her plot with Trent who has been her accomplice all along. Through a little innovation and trickery, Trent and Ann have planned it so that all of the evening’s spooky events will push Nora over the breaking point. After sending both Loren and Nora down into the cellar, Trent is convinced that the girl will shoot Frederick in a moment of hysterical confusion. And their plan does succeed. For when the lights are blown out in the cellar, Nora panics and guns Loren down as he tries to stop her. Aware of her fatal mistake, Nora runs away screaming as Trent emerges from his watching place in the shadows. Rolling Loren’s body over to the open acid vat, a sudden splashing confirms that a body has been thrown into the boiling liquid. When Annabelle later enters the cellar looking for Trent, she is met with a surprise as a grinning, ghostly skeleton rises from the acid and lumbers towards her. It is the body of her husband, Frederick’s echoing voice accusing her of all her crimes. Terrified beyond belief, Annabelle fails to watch her footing and finds herself tumbling to her burning doom into the vat. It was unfortunate that she didn’t notice that Loren was actually alive, pulling the literal strings on the skeleton in order to seal his wife’s fate. When the rest of the party members enter the cellar, they are stunned to see Loren after Nora claimed he was shot dead. 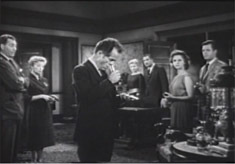 Loren calmly explains that he had put blanks in Nora’s gun as a precaution and had known of the affair his wife was having with Trent all along. He had managed to throw Trent into the vat before the same could be done to him. Now with both of the treacherous lovers dead, Loren resolves to let the law determine his innocence. 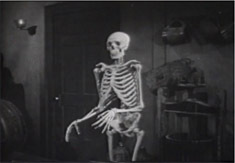 But things are still not right with the House on Haunted Hill, as Prichard claims. For now there are nine ghosts that are lurking about, and as soon as they have found him they will come…for YOU! House On Haunted Hill is an example of an old-fashioned chiller at its best… a foreboding mansion, a promise of money, and more spooks and creeps slithering in the dark hallways than you can shake a poltergeist at. Other than these superficial details, the film retains the fun and darkly humorous atmosphere of those old-dark-house mysteries while still managing to effectively pull off scenes that can give you goosebumps. William Castle was a man who knew fully well how to craft a thriller that delivered the goods. His direct approach is not sleazy or cheap in the least. The film emanates his love and appreciation for the horror genre with every scene. Although by today’s standards, the slightly hammy acting and ghostly clichés of foreboding omens and gliding specters may come off as old-fashioned, these elements are the product of a very apparent respect for horror from Castle. 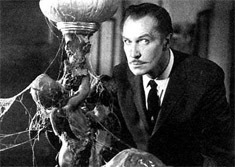 For a man whose name is nearly synonymous with terror, the brunt of Castle’s horror output was displayed in the decade following House On Haunted Hill as seen in films such as 13 Ghosts (1960), Mr. Sardonicus (1961), Strait-Jacket (1964), and I Saw What You Did (1965). Vincent Price delivers his usual charm as the silently calculating Loren, his performance here somewhat more subdued than some of his more eccentric roles but nonetheless immensely enjoyable. 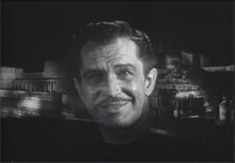 He would later return under Castle’s direction as the misguided scientist Dr. Warren Chapin in the sci-fi classic The Tingler (1959). The rest of the cast perform their roles adequately enough, most of them either having previous experience or future roles in genre television shows such as Lights Out, Thriller, The Twilight Zone, and Alfred Hitchcock Presents. Elisha Cook Jr. stands out from the rest of the crowd playing the doom-and-gloom drunken stock character that would later become so prevalent in slasher films. Screenwriter Robb White teams up with frequent partner Castle to pen the macabre script. While the plot may contain a few holes in logic, White manages to keep the action moving at a good clip and always delivers quality chills and red herrings. 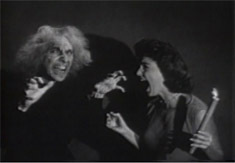 White collaborated on other Castle projects including Macabre (1958) and Homicidal (1961). The theme music by Richard Kayne and Richard Loring also deserves mention, an eerie tune that employs both chilling vocals and a haunting piano accompaniment. It sets the perfect tone for all the horrors that are to come within the dead-plagued halls of the House On Haunted Hill. This is vintage horror at its most delectable. 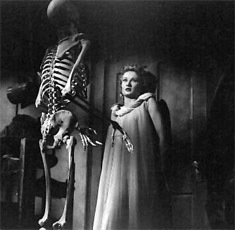 House On Haunted Hill takes the viewer back to a simpler time when all that was needed to get an audience going was a plastic skeleton clanking across a dungeon or a rubbery claw menacingly reaching out for a dark purpose. This film is utterly charming and fun despite all its minor flaws and only seems to become more so with age. Blow the dust off this one and be prepared to ready yourself for a rib-tickling spookshow like no other…death by paralyzing fright guaranteed.